Less than 50% of consumers are willing to exchange personal data for discounts and other benefits — presenting a clear conundrum for retailers on the quest for personalization. Editor's Note: Editor's note: The following is the third installment in Retail Dive's Consumer Survey, a six-part series examining the psyche of the American consumer and the evolving role of the brick-and-mortar store in the shopping journey. Check out all of our results on our landing page. Retailers want more information about consumers than ever before, and analytics technologies today offer an increasing number of ways to get it — whether shoppers want retailers to have their personal data or not. In the race to create personalized experiences for shoppers, retailers and brands are keeping a close eye on purchase behavior and product preferences through loyalty cards. They track shopper search history on their website, monitor coupon downloads from mobile apps and follow social media interactions. But if you ask shoppers, most say they're not willing to knowingly give up personal information in exchange for more tailored experiences or to receive special promotions and loyalty points, according to Retail Dive’s Consumer Survey. For the third installment in our six-part series looking at consumer shopping habits, we asked 976 U.S. consumers whether they were willing to share personal information with one of their favorite retailers in exchange for benefits. The results are in — and roughly three out of every five consumers say they are not willing to share their personal data, such as birthdays, income, car ownership, product likes/dislikes, among other information. It’s little wonder why some consumers are hesitant given newsworthy cybersecurity breaches in recent history. Recall Target’s holiday 2013 headliner? Or Home Depot’s 2014 hack? Consumers don’t easily forget or forgive when their privacy has been compromised. In breaking down the responses of our latest survey, Retail Dive discovered that men are more open than women to sharing their personal data with retailers, as well as consumers under the age of 45 — as long as there’s something in it for them. Here's a closer look at why some consumers are willing to open up and why others would rather keep their information to themselves. For consumers who don't mind handing out personal data to their favorite retailer, the primary reasons for doing so are twofold: 61% say they want loyalty program points and rewards in return, and 61% expect discounts and other special offers. But trading information for a more personalized shopping experience doesn’t hold as much appeal as retailers may think. 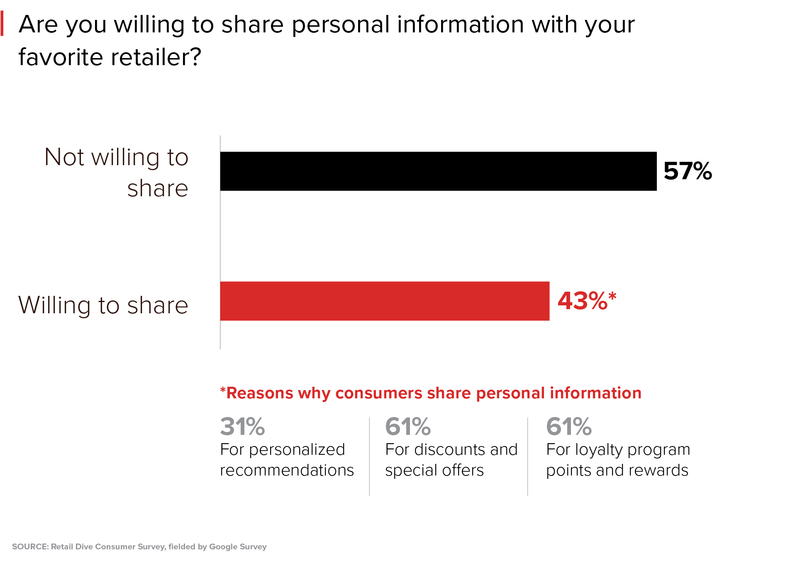 Less than a third of shoppers willing to share information (31%) say they would do so for personalized recommendations. Yet shoppers have come to expect unique shopping experiences, posing a clear conundrum for retailers. Smart players like Amazon have found a way around directly asking shoppers for data. By tracking clicks, page views, wish lists, online shopping carts — not to mention tons of Prime data — Amazon uses detailed algorithms and advanced analytics to offer customized shopping experiences and personalized recommendations, all without shoppers actively sharing their information. 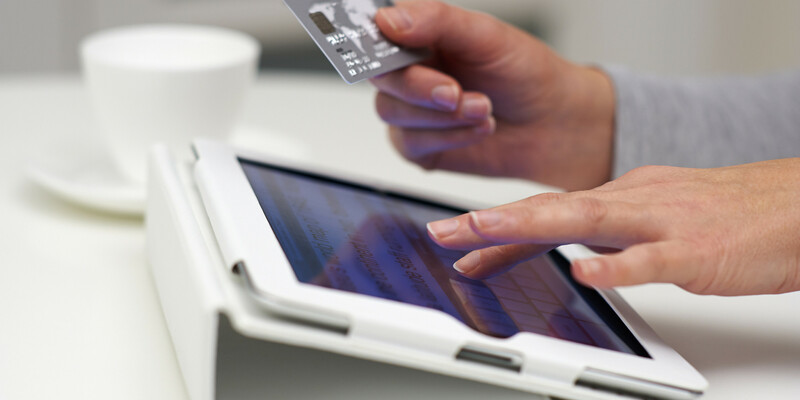 The number of retailers following the e-commerce giant’s lead will continue to grow. Utilizing technology platforms that rely on artificial intelligence and machine learning, personalized product suggestions and customized promotions will soon become just another shopper expectation. When it comes to the gender divide, the survey shows that women are less willing than men to exchange their personal information for retailer benefits: 60% of female shoppers say they won’t share personal information regardless of retailer incentive, compared with 52% of male shoppers who said the same thing. Men and women also differ when it comes to the top reasons they’re willing to share personal information. Of those willing to share their data, 65% of men say they want to get loyalty program points and rewards, followed by 60% who want discounts and special offers. For women, it’s the opposite: 66% want discounts while 59% say they want loyalty program rewards. A higher share of men (33%) want personalized product recommendations compared with women (28%). These findings shouldn’t come as much of a surprise. Retailers have all but trained shoppers to be deal-seekers. Between grocery price wars and heightened competition among off-price chains like TJX and Ross Stores, discounts hold strong appeal for female shoppers. In fact, nearly half of American women won’t even enter a store unless they see huge markdowns, according to a January study from First Insight. Men, on the other hand, tend to lean toward the gamification aspect of collecting loyalty points, which can be turned into credit card rebates, travel vouchers, fuel rewards and other benefits. By a significantly wide margin, more younger shoppers (those under the age of 45) are willing to share their personal information with retailers versus their older counterparts (45+ years old). On average, 62% of these younger consumers say they will share their personal data with retailers. That comes in stark contrast with an astonishingly high 76% of older consumers who say they won’t give personal information to retailers regardless of the benefit. These findings point to a clear generational gap between younger consumers who grew up with computers, smart phones and other digital — making them more comfortable with technology and data sharing — compared with more cautious older generations. The latest findings from Retail Dive’s Consumer Survey have some clear implications. The high percentage of consumers unwilling to share personal information creates an obstacle for retailers that want or need detailed shopper data to conduct advanced analytics and segment shoppers for marketing and other business-related purposes. The findings also suggest that any offered deals or discounts must be extraordinarily compelling to get consumers to change their minds about sharing data with retailers. Not only must promotions, pricing and product selection be spot on, but retailers must also work relentlessly to gain and maintain consumer trust. This means the safe handling and storage of consumer data is becoming increasingly immersed in big data and analytics. Since younger consumers are more amenable to sharing information, retailers can seize the opportunity to provide customized offers and personalized selections through the use of advanced analytics to better target the next generation of shoppers as their spending power grows with age. Stay tuned for the next installment in the Retail Dive Consumer Survey series, in which we examine the phenomenon of shoppers who go to stores... only to later buy online. We'll be back.